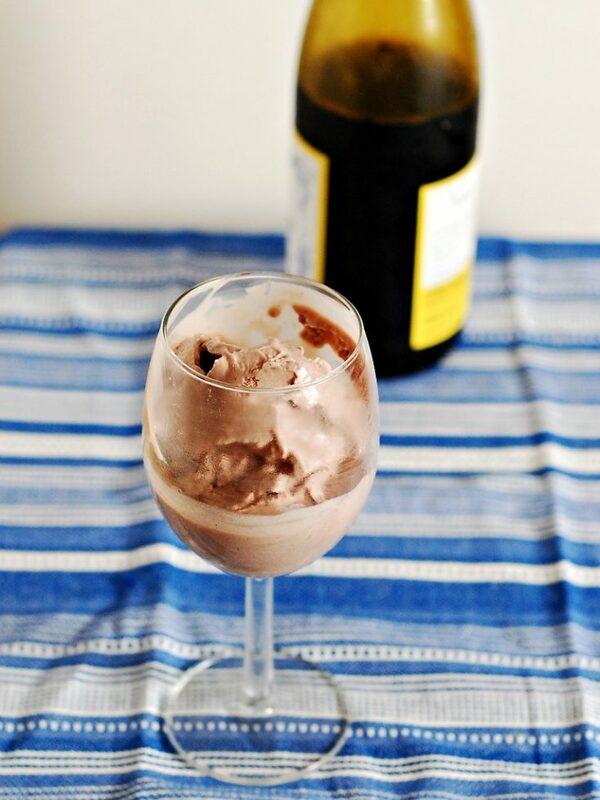 Turn your favorite brand of pinot noir into a beautiful, dusky purple ice cream! Reduced wine concentrates the flavors of the wine, and sugar balances out the tartness. Welcome to Day 6, the final day of Ice Cream Week 2014! This year the event is hosted by Kim of Cravings of a Lunatic and Susan of The Girl in the Little Red Kitchen. We have teamed up with 25 amazing bloggers to bring you ice cream treats all week long. I hope you all threw out the scales this week. Better not to look! Our sponsors for the event have provided us with some great prizes. A huge thanks to Cake Boss, Anolon, Microplane, WÜSTHOF, Page Street Publishing and Quarry Spoon. Kim of Cravings of a Lunatic and Susan of The Girl in the Little Red Kitchen have tossed in a bonus prize of a Cuisinart Ice Cream Maker because they think everyone should own one! I was browsing the internet for inspiration for “unusual” ice cream flavors. I don’t know about you, but when I churn ice cream at home, I want to make a flavor I can’t find in the store. I came across a recipe for red wine ice cream. I’m a huge fan of wine, both white and red, but the beautiful color of the red wine ice cream was mostly what drew my attention. So, I grabbed a bottle of my favorite pinot noir, with undertones of black cherries and strawberries. 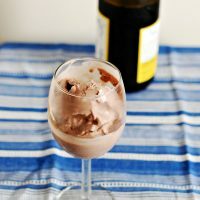 You can use any bottle of wine in this ice cream, it doesn’t have to be outrageously expensive, but it should be something you enjoy drinking. Reducing the wine prior to mixing the base concentrates the flavors of the wine. Dave also commented that he still tasted the “oakiness” of the wine, something he really enjoyed. This ice cream is amazing on its own but would also taste great with a fruit sauce (particularly one that complements the undertones of the ice cream) on top. Pour the bottle of wine into a large saucepot. Set over medium heat, and allow to simmer until reduced to 1 cup of liquid. This took about 90 minutes for me, but it can vary depending on how hot your burner gets, so check it often. In a medium saucepot, stir together brown sugar and heavy cream. Split the vanilla bean in half and scrape seeds. Add seeds and bean pod to the cream. Cook over medium heat, stirring constantly, until mixture begins to scald. Meanwhile, in a small bowl, whisk eggs vigorously until light-colored and slightly thickened.. Remove the vanilla bean pod from pan and temper the hot cream mixture into the egg yolks. Return the egg/cream mixture to pot and place back over medium heat. Cook and stir until mixture thickens enough to coat the back of a wooden spoon. Remove from heat. Place a strainer over a large bowl. Pour in the 1 cup of half-and-half. Pour in the thickened egg/cream mixture through the strainer to get out bits of cooked egg. Lastly, stir in reduced wine. Chill in fridge for at least several hours. Churn in your ice cream machine according to manufacturer's directions. 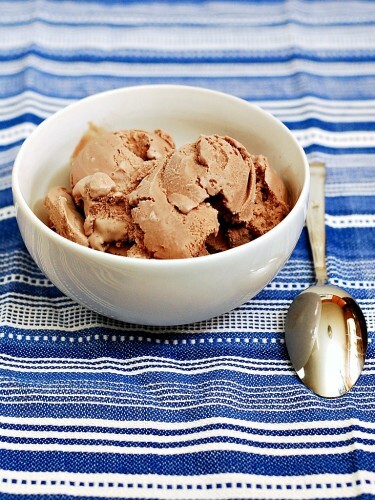 Scrape churned ice cream into a storage container and place in the freezer to harden. Kim and Susan would like to thank all the participants and sponsors for joining in the fun. It’s take a village to make this much ice cream! Coleen, this is definitely an unusual flavor and one that I’m very intrigued to try. Thanks for bringing this to IceCreamWeek! What a good way to combine the creaminess of ice cream with the tang of wine. Squee, I cannot wait to try this recipe. It’s perfect, and brilliant. Thank you SO much for joining us for this event. I am so thrilled you were along for the ride. Hope you’ll join us next year. What the………….Coleen, I would have never thought of this!! What a great idea, I have to try this ice cream! !